Anthrax Lethal Factor (LF) is a zinc-dependent metalloprotease, one of the virulence factor of anthrax infection. Three forms of the anthrax infection have been identified: cutaneous (through skin), gastrointestinal (through alimentary tract), and pulmonary (by inhalation of spores). Anthrax toxin is composed of protective antigen (PA), lethal factor (LF), and edema factor (EF). Protective antigen mediates the entry of Lethal Factor/Edema Factor into the cytosol of host cells. Lethal factor (LF) inactivates mitogen-activated protein kinase kinase inducing cell death, and EF is an adenylyl cyclase impairing host defenses. 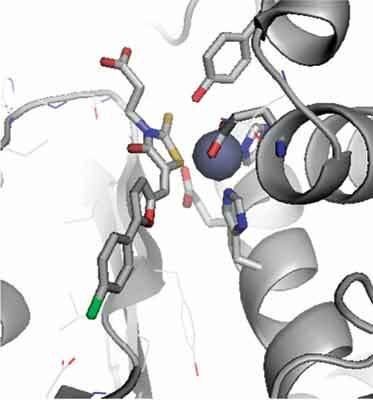 In the past few years, extensive studies are undertaken to design inhibitors targeting LF. The current review focuses on the small molecule inhibitors targeting LF activity and its structure activity relationships (SAR). Anthrax, bacillus anthracis, lethal factor, LF inhibitor, metalloprotease. GVK Biosciences Pvt. Ltd, Phase1, Technocrats Industrial Estate, Balanagar, Hyderabad-500037, Andhra Pradesh, India.